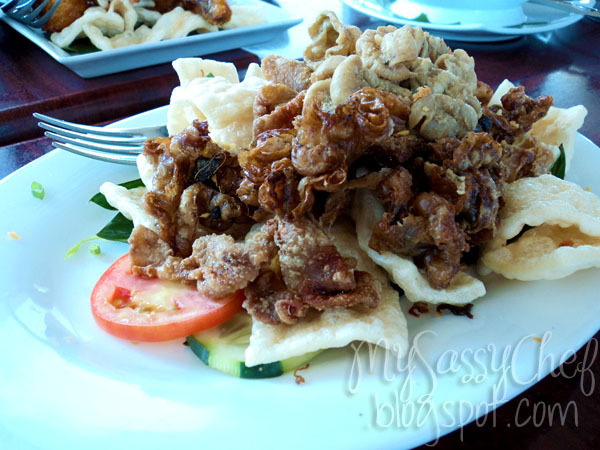 I'm a big fan of calamari, those battered rings of squid coated in a rich batter and deep fried to a crisp. Served with rice, or on its own with a sweet-spicy vinegar dip, this simple dish is definitely a winner for both kids and adults alike. This yummy treat is from Mymy, the wonderful author of My Bric-a-Brac. I'm a big fan of taho and soy milk. We used to have our own soy milk maker here at home, but it's not working anymore. Soy milk that's missing from our diet is tolerable, but to have our morning servings of hot, steaming cups of silken tofu glazed with sugar syrup and tapioca balls is something else. I wondered why our taho vendor has gone missing, turns out he was selling in the afternoons, carrying two large containers of flavored taho. On a recent project with City Delivery, they also sent me Manang's famous twice-fried chicken and Ha Yuan's chilled taho, aside from the Bale Dutung meal. What I love about this taho, though, that made me feature it is that it is so silky and cold, with a light sugar syrup that won't make you guilty when you indulge. Yes, I love pouring lots of arnibal (caramelized sugar) in my taho. 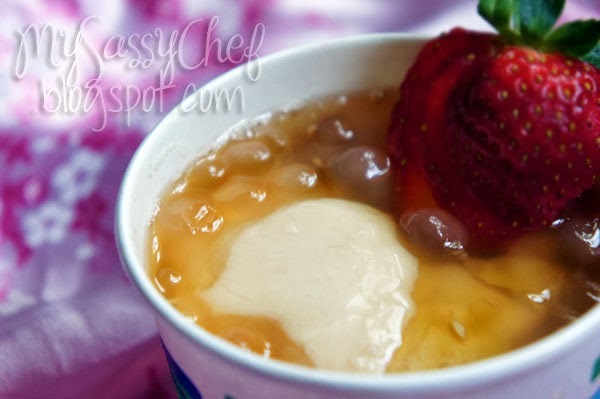 And what's better is that their taho tastes sooo good with fruits because of the lighter syrup, and it makes a great and healthy afternoon snack! 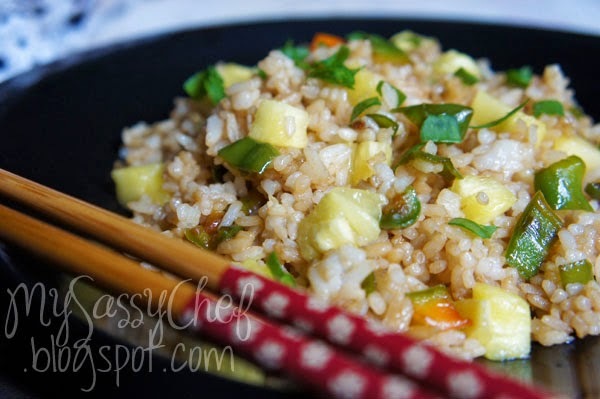 Pineapple fried rice is Thai in origin. The sweetness of the pineapple chunks combines well with the wonderful aroma and flavor of the bell peppers, and the salty taste of soy sauce. It usually has a moderate amount of heat, but since I made this one from scratch on a lazy morning, no chilis for me. It's not as colorful as the ones made with bright red chilies and red bell peppers, but I can assure you, it really brightened up my day! Here's my version of a Thai-inspired pineapple fried rice recipe, all made from what I could find in the kitchen. What's wonderful about this is that it doesn't have a strong or too savory flavor that would overpower the taste of whatever meat or fish dish you're having with it. It's mild and sweet, and it reminds me of our younger days in the province where we eat our meals with fresh ripe mango chunks mixed in with the rice. Combine the olive and sesame oils. In a wok, heat the oil. Saute the garlic, ginger, and bell pepper until fragrant. Add the cooked rice and pineapples. Stir until well mixed with the oil. Pour the soy sauce and oyster sauce and mix well until evenly distributed. Heat through, and top with chopped scallions. Fish and Chips by Jenn of I Live To Eat! Each week, all the participants who submit their links to Weekday Potluck will be included in a list. For each following week, those included in the previous week's list will be placed at the end of the post of each participant, so everyone can have their links exchanged. So if you participated last week, you are included in the sponsors for this week. Those who do not include the link list at the end of their post will not be included in the list. Participants for this week who follow the guidelines will be included in next week's sponsor list. There's no more need to place the button at every post, instead the small link list will take its place. This is the test run, if everything goes smoothly, then the automatic link exchange will be a keeper. SM Hypermarket has just reached its 10th anniversary, and to celebrate, well-known chefs are giving their Cooking Marathons and Demos live in many Hypermarket branches nationwide. From July to September, every week there will be cooking demos in different branches. To catch their wonderful events in your area, see the Cooking Marathon Schedule. Apart from the Cooking Marathon, they are also giving away a kitchen makeover to one lucky winner. SM Hypermarket will also be holding Supersized Cook-off Series, so watch out! With only a little more than a month to go, make sure you don't miss out on the culinary events SM Master Chefs have to offer. Yesterday's Cooking Marathon was held at SM Hypermarket in Sucat, Paranaque, with Chef Jonathan T. Chua on the spotlight. He finished Hotel Restaurant and Institutional Management from De La Salle College St. Benilde, as well as a graduate of California Culinary Academy with the Associates Degree for Culinary Arts and Baking. Chef Jonathan started off the event with a little background of the sponsoring brand, San Miguel Food Corporation, and went off to the cooking demos of four dishes for today. There was audience participation, a Q&A throughout the demo, as well as raffle prizes for the participants. 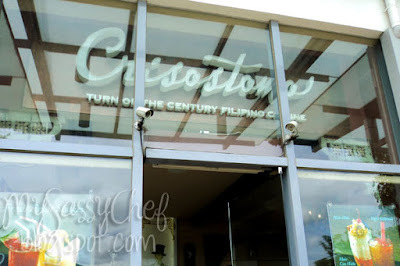 Crisostomo gave me the impression of a restaurant serving upscale versions of classic and well-loved Filipino food. It has a rustic and homey feel to it, and unusually peaceful. It's something you would look for when trying to escape the bustling city life of Metro Manila. I was warned, though, that we were just lucky. In the evenings and on weekends, Nuvali is packed with a lot of people. 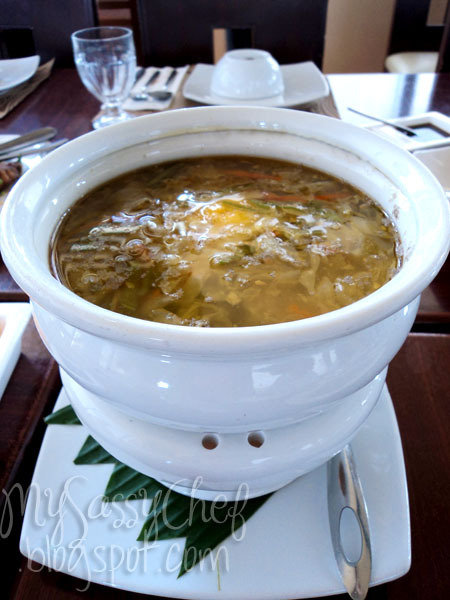 For our appetizer, there was wonton soup and sinigang na sugpo. What I love about their wonton soup is that it wasn't salty. 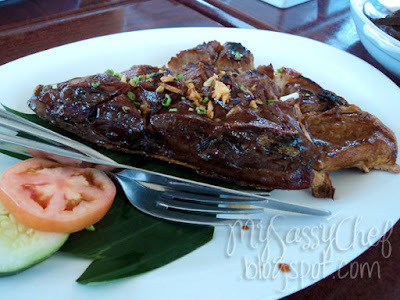 There's also crispy pata and the chicharon bulaklak below, which is so surprisingly not greasy. Of course, you can't take all the fat away, but compared to those sold in stalls by the mall, you'd probably consider it oil-free. Just crisp and light. 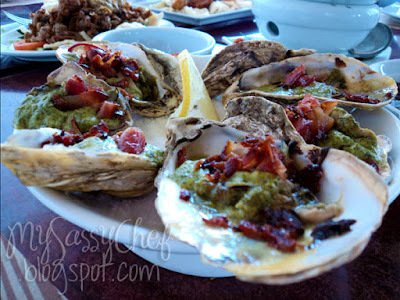 Crisostomo's Tiagos Triumph, oysters topped with creamy spinach and bacon bits, is probably my favorite among the dishes served. The creamy spinach and bacon blended well with the slightly metallic taste of the oyster. 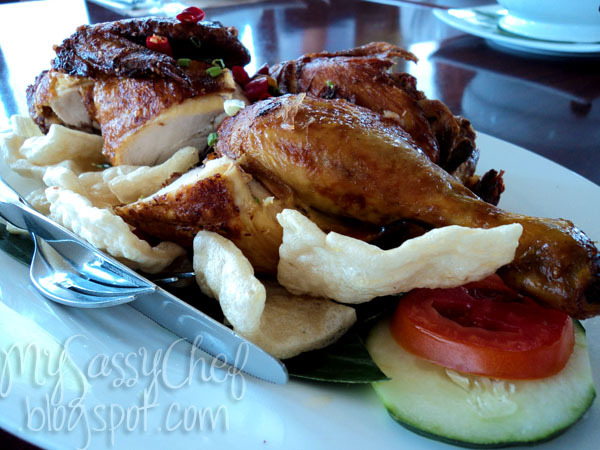 Then there's the whole fried chicken dish named San Gabriel, which reminds me of Max's chicken. 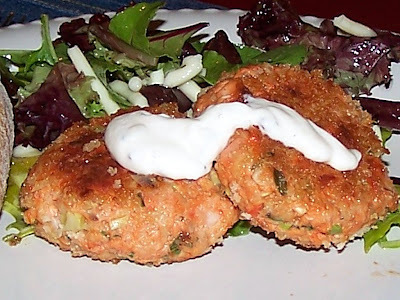 Crispy, savory skin and juicy, flavorful meat. Need I say more? Their San Lucas, is basically marinated tuna cheeks (they call it panga or jaw, but I beg to differ) that are grilled to perfection. It's good, but I've had a lot of tuna in my life and there's nothing too unique about this one. If you're looking for delicious laing dishes but you're not fond of the spicy taste, then you might as well have their Sinang con Laing. It's gabi leaves stewed in coconut milk. 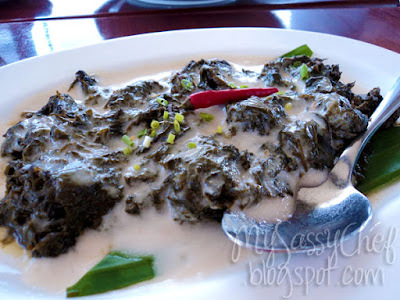 I would have loved it completely if it were a bit spicier, but despite lacking the spicy part of being a laing dish, it is actually yummy. 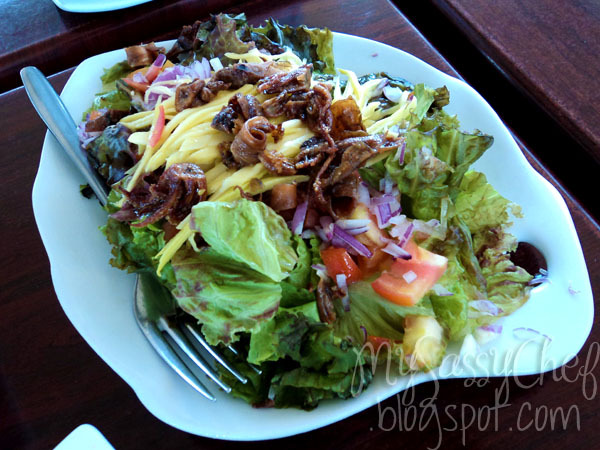 When I saw their Crazy Sisa Squid, I thought that this is something new to me, in the sense that I always had green mango salad, but this time with crispy strips of fried catfish. 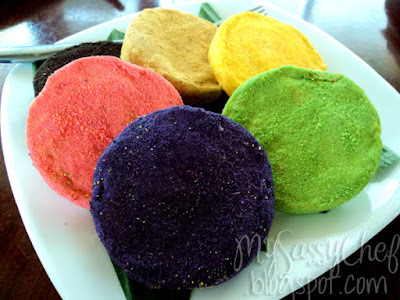 I had the pandan-flavored one, which is really yummy, and a nice deviation from the usual chocolate or vanilla flavor. I'm not really fond of fried rice. 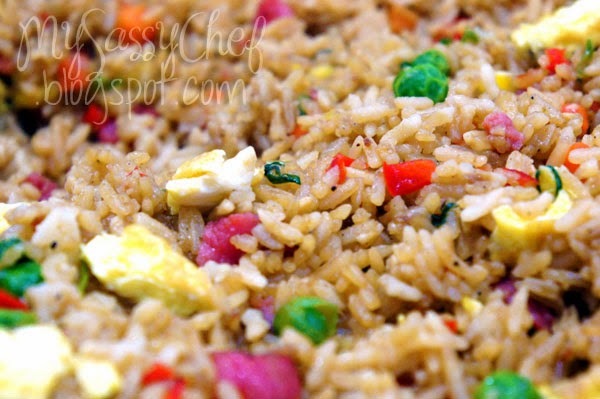 That is, if we are talking about the greasy, bland, fried rice infused with tons of yellow food color and topped with a scant amount of garlic. 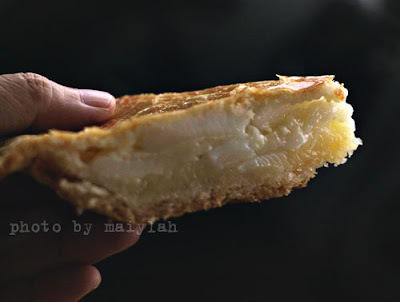 While I always opt for plain rice whenever we eat out, at home it is quite different. Everyone loves waking up to a hearty breakfast, right? Well, in my case, they are the ones to wake up to that because I'm doing the cooking. But even on days like this, I sure loved cooking this sweet and sticky, savory tocino fried rice. 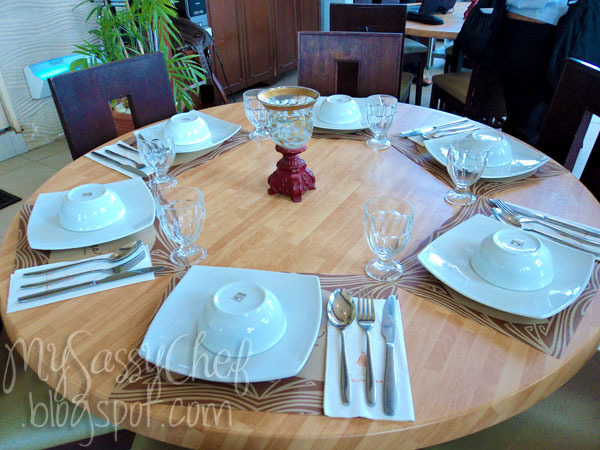 If you happened to read my post regarding the SM Master Chefs event I attended, we were shown how to cook Tocino Chao Fan during the cooking marathon. I usually associate that name with Chowking, so I am vouching for fried rice instead. 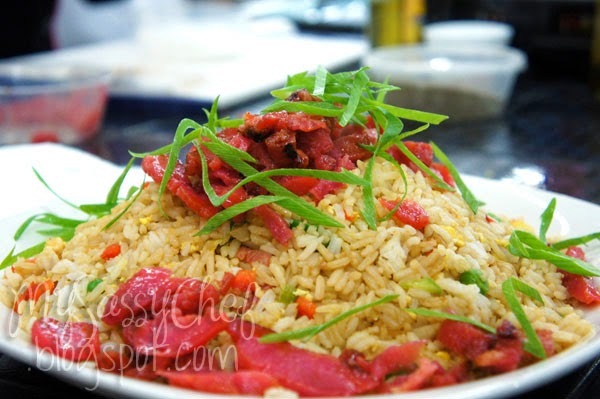 This is my take on the tocino fried rice, which is sort of a mixed up and homey fried rice as opposed to Chef Cauilan's Tocino Chao Fan (photo below). The beauty of home-cooking is that you don't really have to make it look great when you're cooking so early in the morning. 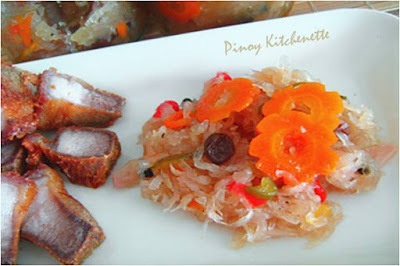 Slice the cooked tocino into small pieces. Heat the olive oil in a large pan. Saute garlic, then add leeks. Stir for a a few seconds. Add mixed vegetables, followed by the tocino. Add in the rice and mix well. Add the oyster sauce and mix until evenly seasoned. Pour in the beaten aggs and quickly mix to spread. Heat through for five more minutes. With the end of the year drawing near quite quickly, everyone's starting to get hyped for the Holiday Season. It usually starts during September, and the malls are quick to put up decorations and early Christmas sales to get shoppers in the mood of generosity. Pasko means Christmas in Filipino, and it has always been our tradition to scour every shopping mall and stores for the perfect gifts for our loved ones. Pasko sa Agosto is a collection of giveaways all ending at August 31st, just in time for the start of early Christmas, started by SAHM Writes. 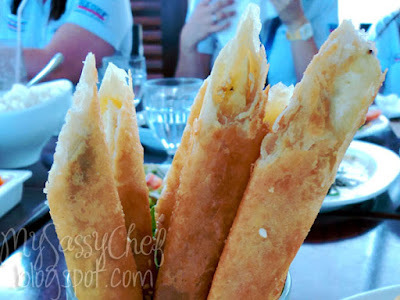 To celebrate this blog's fruitful half of the year 2011, Sassy Chef is giving away something not conventional. I'm supposed to give away something related to food, but since some of the sponsored items haven't arrived yet, those will be for the next giveaway. Before the reveal, let me explain why I chose this. In the news, I have heard a lot of incidences wherein a child is always caught between two parents fighting. Some of the headlines report that someone in a relationship (read: married) was killed or hurt by the other because of an unhappy marriage. While it doesn't always end up this violently, I know many people who are having trouble with their marriages, so this would be a great gift to yourself or to a friend who needs something to boost their relationship. If you have a good relationship, this will stimulate you to grow deeper in love with each other. If you are struggling in your marriage relationship, this will provide hope by giving you biblical and practical help. These are two volumes of Mahal Ko Ang Aking Asawa, a talk held by Pastor Clem Guillermo. They are in VCD form, but my mom said she watched her copy on the DVD players and it is working well. She bought this in Canada, so I have no idea if they are sold here, and I believe it is in English. Last week's potluck has almost gone bad with a few issues with inLinks, but everything was resolved and gave way to the second week of weekday potluck. I still am trying to get the hang of hosting a meme, and I'll probably make a few changes with the schedule and other things to make it more convenient for the participants. Jenn of I Live To Eat served up a creamy plate of yummy Carbonara. 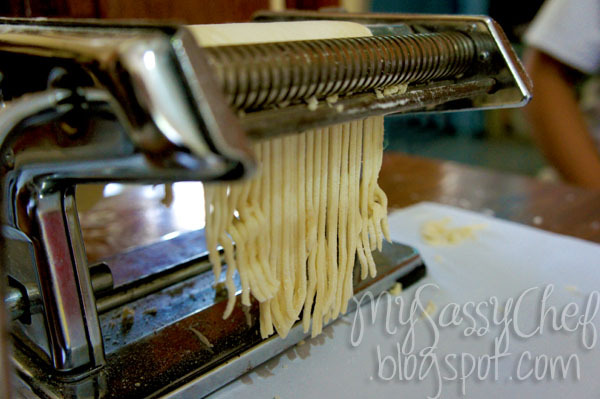 Everyone loves pasta, and this is one of my favorite pasta dishes! 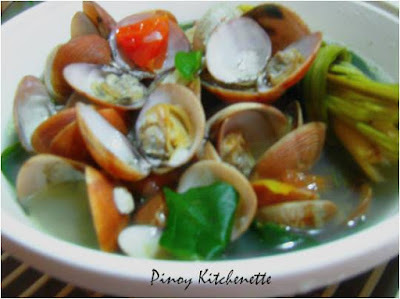 This Lemongrass-infused Clam Soup cooked by Margarita of Pinoy Kitchenette is definitely a great dish to have during the long and rainy days. Very yummy and comforting indeed! Rose of I Am No Fangirl whipped up a savory plate of Beef Steak for the potluck, and added some flavorful twist to it by infusing the dish with star anise. Yum! Link to your post page, not your homepage. Link back to Sassy Chef in your blog post using the button below or any text link going to My Sassy Chef's homepage. 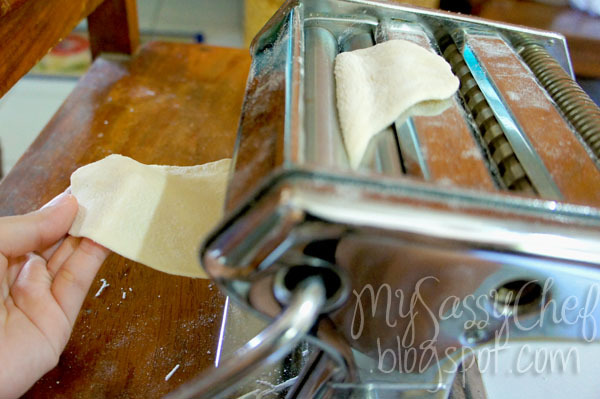 Sift the flour and salt together on a clean table or counter. 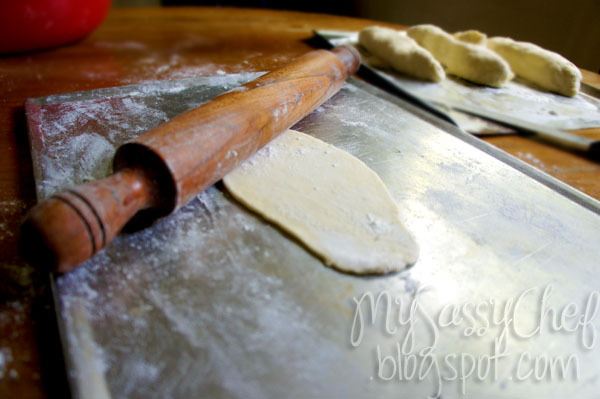 Make a well in the center of the flour, pour the oil and crack the eggs into the well. 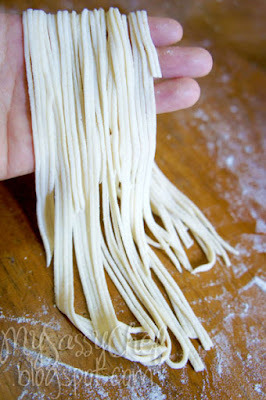 Using a fork, slowly beat the eggs and oil into the flour, working your way from the center outwards. 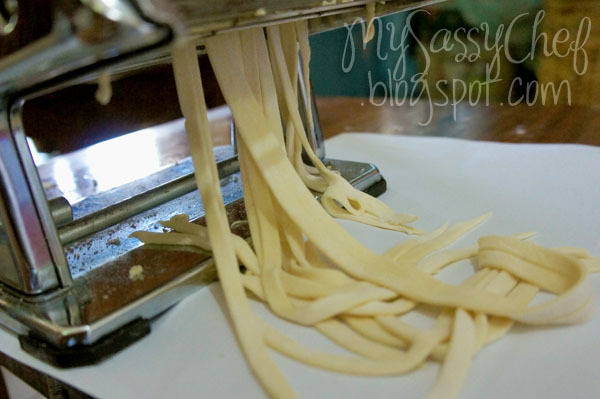 Knead the dough until firm and dry. It should form a firm ball, but it shouldn't stick to your hands. 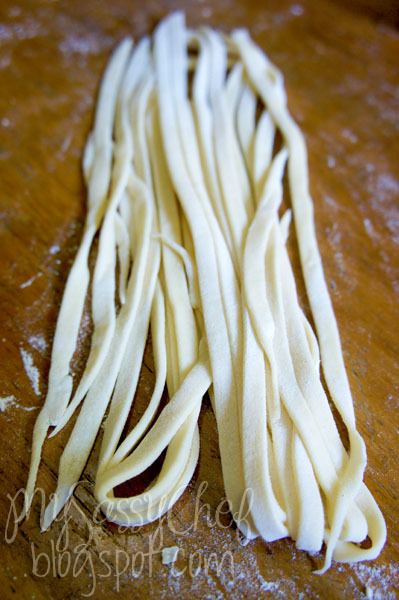 If it's sticky, add more flour little by little as you knead, until it's no longer sticky. Divide the dough into small four-inch balls. Roll out a bit, then pass through the machine for an even thickness. Let dry for a minute or two, flour generously, then pass through the cutter. Whether you're a blogger, a columnist, or a student racking your brains out to get your mojo flowing, it's always nice to say that there's always a place where you can find peace and stimulation to get those creative juices flowing. If you're like most city dwellers who just can't find your home conducive to thinking, either from the noise of a nagging relative or the crazy running around of kids who woke up extra early, McDonald's is opening its doors for you even at the wee time of 4 in the morning. And no, I am not compensated for this advertisement, if any of you are wondering. While coffee is a known stimulant, and lately there has been a surge of gimmicks to boost the sales of coffee, a hot, steaming mug can offer you a lot of comfort and the energy to finish that writing assignment or to improve that thesis you've spent sleepless nights trying to figure out. I've seen slimming coffees and coffees advertised to make your skin glow, among others. But it does come down to one thing, coffee has been a part of our lives here in the city that no matter how things go bad, we can always have a cup be it hot or iced. at any McDonald's breakfast store from 4:00 a.m. to 10:30 a.m.
Be on the lookout for the McDonald’s crew who will distribute the coupons in selected offices, universities, colleges, terminals, churches and even outside the McDonald’s stores nationwide starting August 5! 4:00 a.m. to 10:30 a.m., from August 8 to 12 to get an 8oz McCafe Premium Roast Coffee. 2. Only one (1) 8oz. McCafe Premium Roast Coffee can be claimed per coupon. 3. Coupon will be surrendered at the counter upon redemption of the free coffee. Redemption will be within the promo period only. No coupon, no free coffee. Get Your Mercato Centrale Fix With City Delivery!